Those apostrophes are both wrong and inconsistent. And are those em-dashes where en-dashes should be? 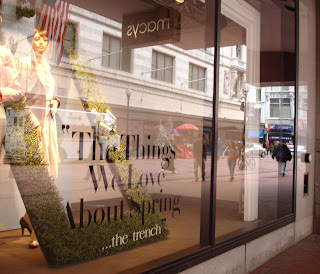 Macy's in Downtown Crossing also features unnecessary quotation marks on its window displays. 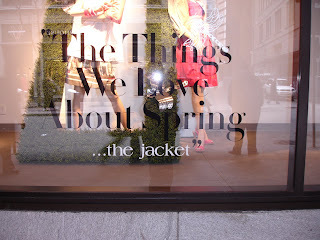 Unless they're quoting someone who said, "The things we love about spring ... the trench," this is wrong. Ever since I discovered em dashes -- which was recently -- I cannot stop using them because not only are they so functional, they are also very literate -- adding class and bombast to every sentence. This is especially true in academic writing, where I dwell in, and it really sets my writing apart from my peers. On rereading, the last sentence should read: it really sets my writing apart from my peers'. Hey, Curtis, thanks for your comment! I like em-dashes, too. They can add drama and suspense. *groan* And I thought Macy's was better than this! Hi, I like your blog. 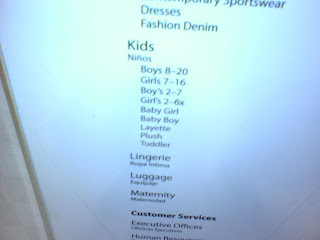 I see you are talking about Macys here. Well, I used to be their constant customer, then after a certain accident I stopped going there. In some time my friends too. I went to this great site www.pissedconsumer.com to see if anyone else had problems with the company and it turned out that my friends and I were not alone.